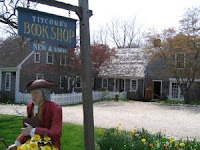 This past weekend, I made my first trip to the relatively famous and absolutely wonderful Titcomb's Bookshop in East Sandwich, Mass (out on Cape Cod). First off, it's worth the trip to the Cape for the shop alone. Three stories of new, used, and rare, collectable antique books will keep any casual browser or book-obsessed shopper content for hours on end. From time to time, they have author signings and book readings as well (most recently Richard Russo reading from his latest release, That Old Cape Magic). What really caught my notice, though, was the entire shelving unit downstairs titled "Books on Books." Talk about a booklover's paradise. Antique editions of ALA listings, books on the world of publishing, and (my personal favorite and almost-purchase) the top 100 listings of the top 100 books of all time (from 1947). Kind of a neat classic, that, but overpriced for something I'd most likely never read. 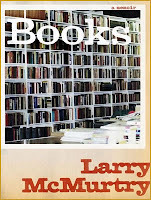 When I own a bookstore (one day), I think I will continue this "Books on Books" concept -after all, it is us booklovers and fanatics and obsessive collectors that will be keeping the publishing business afloat as the world struggles to understand how ebooks will change the written word as we know it. I will add to it, however, that fine collection of memoirs and fiction dedicated to booklovers as well - most notably Leave Me Alone, I'm Reading (the memoirs of NPR's book reviewer, Maureen Corrigan, and the perfect early birthday birthday present from my mom), Books (the life and thoughts of Larry McMurtry, bookstore owner, writer, publisher). There's a whole host of new titles on booklovers coming out this fall, but that's probably enough for a second post. Stay tuned! I would also like to point out that I picked up at 107 year old copy of a reprint of Sketches by Boz. I'm fascinated with it. And I only paid $8.00, which actually... I feel like I should have paid more just on principle. Yes, I was going to mention that but seem to have forgotten. I got a first edition hardcover of Chesapeake to replace my water-damaged mass market paperback for $3. But then there were other oldies priced $100+. I'm sure if I knew the world of book collecting better, I'd understand why.